This month my sister and I have releases from secret cravings. People ask us being twins if we write the same things or have the same story lines, we always say no. 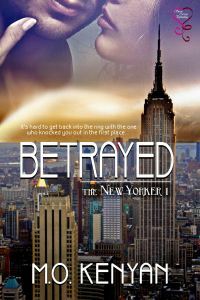 How about you grab a copy of HIS BAHAMAS AFFAIR and THE NEW YORKERS I BETRAYED (OUT ON THE 27) and find out. closer he gets, the harder she pushes him away. I think I deserved this room, back in 2011. Now it’s been a few years, and my room has just been changed over to a “romantic” baby room for daughter number three, who’s coming home soon to raise her almost-born baby as a single mom. But here’s a fun story about how this came to be. Hope you enjoy it! After all that – I think I deserve this new room of mine. Okay, those of you who know me realize I’m exaggerating, because I adore my daughter, grandchildren, and animals. Since they moved out to their own place just a few miles down the road a month ago, I’ve been filled with conflicting with feelings of terrible longings for their company… mixed with blessed relief. I call them constantly, with any little excuse. And I ache to see the kids every second of every day. But there is a bright side to all this, and it’s the reclaiming of our home. It’s clean. Oh, is it clean. Organized. Tidy. Polished. Shiny. Dust-free. This is the 200th anniversary of our 1811 house, and in the spirit of giving ourselves a little reward, I decided to redo the boys’ bedroom. We gave the kids all the furniture, anyway, so it made sense to change things around a bit. I’ve never had a writing room. I’ve never had a home office. I never even had a corner of a room that could be mine, where I could write in quiet and focus on getting my characters into trouble, and finagle the plot so they could be saved again. I always had to clamp headphones over my ears to drown out the television, or get up at 4 AM to find some quiet time to write. My usual typical writing spot is my comfy leather chair in our bedroom. It’s too close to the TV, though, and my wife enjoys have it on all the time. But I like to be with her, so I hang out in the bedroom in the evenings. But that means I’m always tuning out whatever sit-com blasts from the darn thing. Sometimes, for an hour or so in the freezing cold dark winter mornings, I sit in the living room downstairs while the fire takes hold in the woodstove. But I’m often distracted by the need to let the dogs in and out, clean the cat pan, put a load in the washer or dryer, make my lunch for work, take out something to defrost for dinner, load up the wood rack by the woodstove, etc. You get my drift, all the usual pre-work morning stuff. So unless I got up, again, at 4 or 5 AM, I don’t get much time to focus on writing. Okay, so all this is leading up to me trying not to feel guilty for spending too much money on what I’m calling my “zen* room”. It’s a romantic writing, reading, thinking, quiet room. I thought of my wife when I designed it, and have also referred to it as her “sitting room”, because I made it kinda girly-pretty and put her Keurig coffee maker in there. I know, I know. You’d expect a guy to want a MAN cave, right? Something with lots of leather, dark wood, heavy curtains, beer posters, big screen TV, sports trophies, and the like. Well, I have something sort of like that in our living room already, with dark antiques and brown leather couch and club chair. Ahem. Minus the beer posters and sports trophies. But this time I departed from that model. I guess I figured I wouldn’t feel so guilty for spending the money if I designed it with my wife in mind. So in spite of the fact that it’s kind of a feminine room, I must state that I consider myself a regular guy in some aspects. I love to do handyman projects around the house, can’t wait to play with the snowblower and lawn tractor, adore chopping down acres of brush and clearing land, and have a list a mile long of outdoor brick-laying type projects I can’t wait to start. But I’m also a guy who loves some not-so-typical things. I’m a great deal like my character, Gus LeGarde, who is frequently referred to as a Renaissance man. Gus and I love antiques. We love Chopin. We love to cook. We love French Impressionist art. We love nature. We love to hike. And, we love to cross-country ski. So, that was my lame attempt to prove to you that I really am a semi-regular guy in spite of how pretty this room is. Ha. What inspired this? My hairdresser. Yeah, really. The lady who cuts my hair was running late last month. She offered to let me sit in her new little new-age-comfy room with the water fountain and a footbath. It was so darned comfortable I almost fell asleep several times, and I realized that I wanted one, too! So, let me show you what I did. I ordered this trickling wall mounted water fountain. Still waiting for a pump to be sent that isn’t LOUDER than the trickling water sound, but it’s enroute, so they say. I found turquoise pillows and a throw at Pier One, a vase thingie that holds apple blossoms, or whatever fake things my wife my wants to stick in them during the winter, and then I went nuts and ordered a glass lamp to match the turquoise color that had ended up being so prevalent in the room. I haunted my favorite antique stores to find a perfect – I mean made for this room – antique lamp with the exact same colors that we’d already chosen. Next, I ordered a cherry wall cabinet to store some of my Young Living Essential Oils, an Aria oil diffuser to set the scene, a foot bath and all the good smelling stuff that goes with it, and some gorgeous photos from a wonderful photographer friend. Here are a few images that will eventually be hanging over the loveseat and chair, in large format. See how they miraculously match the room colors? It’s like it was meant to be. One corner of the room that’s pretty much “done.” This is where my wife sits when she joins me and reads on her Kindle. And here’s where I sit, minus the wall art that’s coming. Like I said, pretty darned comfy. And so, as the project comes to a close, it’s just in time for the next adventure of either Gus LeGarde, Sam Moore, or Marcella Hollister. Haven’t decided what’s next yet, but I’m itching to start something new. And by the way – Happy Valentines Day! Guys: Do something extra special for your sweetheart today. Maybe buy her a copy of my new love story, The Seacrest. You’ll brighten up her day, and you’ll feel all mushy inside. Who knows? It might inspire you. Maybe you’ll end up with a girl-cave all your own. *Zen – a teaching that contemplation of one’s essential nature to the exclusion of all else is the only way of achieving pure enlightenment. Trial Of Love, my first Regency book will be available this month! It’s been a long road with this book and I can finally take a breather because it’s done! Trial Of Love, the first book of the Slave Bound series is ready for publication. This book and two others from the series, Lady Nancy and A Lady Unbecoming are being published by Second Wind Publishing best known for their historical romance books with some of my favorite authors Jerrica Knight-Catania and Ava Stone. Melanie’s life in America is full of heartache since her mother died, but she has never allowed herself to fall into a depression- she had to care for her father. A few years later Melanie’s father marries another woman, Geraldine- a woman too wicked to be considered a mother. But she still has no time to wallow in her sorrows, she has two siblings to care of. After years of pain and abuse, her only option is marriage, but Geraldine does not allow her that chance. Sold off to slave traders, Melanie finds herself in an English whore house, her virtue being auctioned to the highest bidder! Christopher, new Earl of Ashworth has only one goal in life- restore the family image to its former glory and bring back respect to his family title that his father had successfully ruined. He doesn’t believe in love and mistrusts everyone, he only believes in getting what he wants no matter the cost. After being sold as a slave, Melanie luckily escapes an auction and hides in the carriage of Christopher Wimberely, Earl of Ashworth. Their romance is rocked with mistrust that proves to be their undoing. 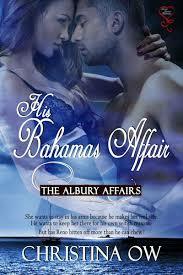 Finally the editing is done and His Bahamas Affair is ready for release. I’m so excited!!! 🙂 And the best part of this is ARCs are available! So if you are interested in being an ARC reviewer, please add your name and email in the comments below before the 12th of February. Also please have your review ready a week after you receive a copy and blog, tweet, facebook etc about it, share with your friends. 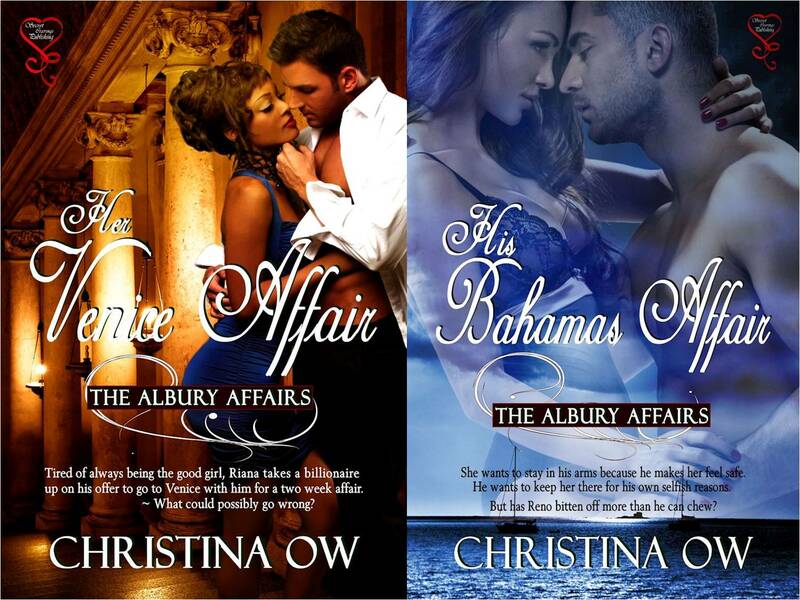 I would like to thank all the ARC reviewers of Her Venice Affair for all their help because they helped HVA shoot to top #1000 at one point. Thank you very much! Now, how about we do the same for HBA? Loraine wasn’t sure exactly what kind of reception she would receive from Reno. More than disgust, she dreaded being pitied and it truly surprised her when he spoke to her like that night never happened. She was speechless, watching that come hither smile play on his lips like they were back to their seductive banter. The man should have been an actor, not even his eyes gave him away. Loraine wasn’t sure how Melody wanted to handle brokering the subject with Reno so she thought best to keep that information to herself and be as vague as possible. She punched his shoulder as hard as she could and yelped at the pain from the contact. “Ouch,” he said with a boring dry tone, not even bothering to look at her. He didn’t even flinch! He laughed and the sound made the butterflies in her belly flutter. “I’m not a child…” she began to grumble when she caught his darkening eyes as he lifted the back of her hand to his lips. Breath caught in her chest as she watched his lips lower to her knuckles. When they came in contact, her eyes fluttered shut and she sucked in a breath. He kissed it lightly, running his lips then the tip of his tongue over her knuckles before he planted another soft kiss. Loraine nodded, unconsciously moving toward him until her chest touched his. He wrapped his free arm around her waist, as the other hand weaved her fingers through his and held them both to his chest. Her head cantered to the side as he lowered his to nuzzle at the nape of her neck. Her body shuddered, pushing closer to his. “Reno…” she whispered softly, turning her head into his. “Mmhmm,” he responded, brushing his nose and lips up her cheek to her temple. When he stopped what he was doing, she thought she’d ruined the moment by bring that night up, that is if he knew what she was referring to when she thanked him. She hoped he didn’t. She nodded, blinking back tears. She went on her tip toes and pressed her soft cheek to his rough one. He tightened his hold on her waist and lifted her up, supporting her.